As we look back at 2011 we are realizing just how blessed we are. We met so many fabulous couples this year, so many of them became friends and a few we have even got to see their family go from 2 to 3 people which just love. There are so many special moments from each wedding and event that I wish we could kick back and recap each and every one of them. We owe so many vendors a huge Thank You for performing beautifully under some crazy circumstances and making it possible for us to capture their beautiful work for everyone to enjoy for a lifetime and more. Some of my personal favorites will be popping up on our blog as 2011 comes to an end. Today I am sharing with you bouquets and flowers. Oh man was choosing my favorites difficult! So many textures and colors! Ahhhh these photos bring a smile to my face. Adkins Wedding: The beautiful flowers above are some of my favs! They are designed by A Rose in Bloom owned by the bride’s mom and were set as a team with Travis Lee of Functions Events. Behm Wedding: As most of you know, I am a huge pink fan so of course I think the above flowers and perfect! Designed by Functions Events. Moore Wedding: These bright arrangements we a hit at this wedding! They were a great pop of color! Designed by Z’s Florist. 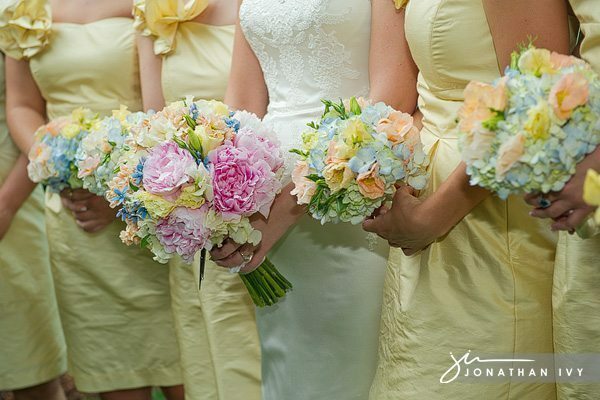 Seale Wedding: These elegant pastel flowers just stole my heart! Designed by DiFiori. Raetzsch Wedding: Love when a family memory is tied into the wedding and in this case the bouquet is wrapped in the bride’s mother’s wedding gown. Designed by Edwards Florist. Tower Wedding: I believe the brides gorgeous white bouquet compliments the girl’s flowers perfectly! Designed by Lefleur Couture. Usrey Wedding: So I’m sure I’m partial since this was my cousin’s wedding but I though all of the bouquets fit her perfectly! These are bright & beautiful! Designed by San Antonio Floral Design. Bradley Wedding: The above flowers were created by a good friend and in my opinion one of the Best Florist is the DFW! Her work is always perfect! Designed by: Kate Foley Designs. Cherian Wedding: The gorgeous bouquet above was created by the bride’s friend & bridesmaid who is also a florist. Created with love you might say! Designed by AK Floral Designs. DeMaagd Wedding: LOVE the pop of purple here! Purple was such a hot color this season. Designed by Di Fiori. Porter Wedding: I don’t think this bouquet could have been more perfect! Stunning arrangement! Designed by Antebellum Designs. Dublin Wedding: The use of flowers in this bouquet is fabulous! Love how they stepped outside the box on this one = Gorgeous! Designed by The Senterpiece! Blout Wedding: Love the touches of light pink in the bride’s bouquet and how the table’s centerpiece compliments the bride’s flowers. Designed by Fete Des Fluers. Roser Wedding: The use of 2 different roses in this bouquet gives it a very rustic red look. Taking the basic red bouquet to a new level! Designed by Twigs Florals. You are some really special people. Thanks for the recognition and taking such beautiful pics!